"The two players I've always loved watching are AB de Villiers and Kane Williamson". We're past the generation that hailed the Sachins and the Laras as idols; it's time for the millennials (haven't we grown up?). Teenager Varun Nayanar was just 8 when Williamson debuted in 2010. Nine years later, Varun is part of the next batch of talented hopefuls, all set to represent India Under-19. For a 16-year-old, Varun exudes maturity way above his peers. He talks in a steady manner, calculating and analysing, much like his batting. In the words of his U-16 coach, he's 'a risk-free batsman'. "I like to bat long and stay put in the crease. That's my style," says Varun, in an exclusive interview with Sportskeeda. The batting wicket-keeper is part of the Indian U-19 team that will host South Africa for two youth Tests this month in Kerala. Kerala is Nayanar's home, but that's just one part of the story. He studies in Dubai, where his family is based, and astonishingly, shuttles back and forth between India and UAE to play cricket. He sometimes stays away from school for months, travelling frequently all around the year. "The school supports me a lot," says Varun. "Whenever I miss any class, the teacher sits with me, sometimes even till 4 in the evening to teach me. My parents have been very supportive, they've been asking me to enjoy my game and just play as long as I want to. No pressure of studies," he concedes. Part of GEMS Modern Academy in Dubai, Varun is described as 'humble' and 'dedicated' by his classmates. A story goes that when the youngster got the news of his selection, he distributed a box of chocolates to all his teachers. Oblivious to his achievement, the faculty wondered if it was his birthday. That's when he shyly announced his U-19 selection. Cricket aside, his interests lie in the domain atypical of a 16-year-old today - he likes to relax with his books, or go trekking or swimming, preferring to play outside than at home. Yet, it was inside the house when he was first initiated to the game - as a 7-year-old, a plastic bat in his hand, against a tennis ball. Very soon, the bright kid was learning the ropes of the game and progressing up the ranks. In December last year, Varun became the youngest U-19 double centurion for Kerala, against Saurashtra in the Cooch Behar Trophy. 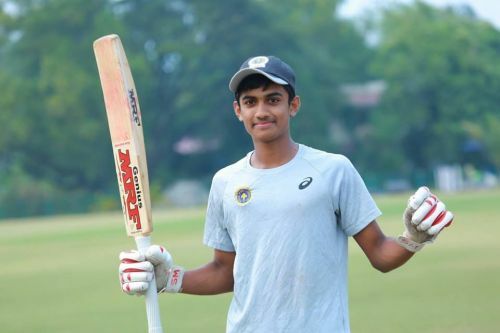 The jump from the U-14 and U-16 levels to U-19, and beyond, can be extremely challenging, but Varun plays down the hype, even though he is following a list of illustrious names, several of whom have gone on to play for the country. "It is the same bat-ball game. The quality may be different, but it is the same game being played everywhere. They might be stronger and a bit more consistent, but otherwise, it should be the same". Having said that, the youngster knows that the road is long, and he needs to keep clearing out his weaknesses, while focussing on his plus points. "You can't be perfect. There is a lot to improve for everyone, just to know your weaknesses and work on them, and improve them slowly. Fitness is something I need to work on". "I am not someone who is very bulky or strong. I need to work on my strength. But yes, I need to work on it step by step". "That said, my temperament on the ground is my biggest strength, I am patient, I take my time and I know how to handle situations. That comes in handy." 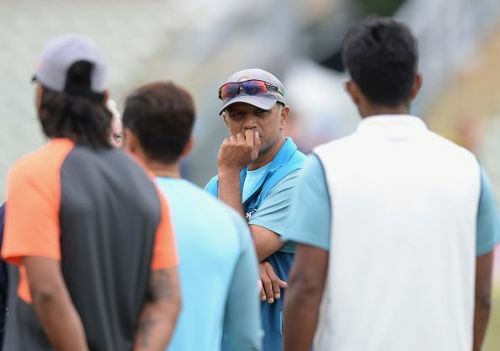 "Just watching and learning from him would be a great experience"
And who better to work with, than Rahul Dravid, the U-19 coach, under whose tutelage, India is moulding sparkling stars for the future. "It will be a great thing to just be in the same team as Rahul sir. He is someone who has played cricket for so long for India, one of their best ever batsmen. It will be an honour to be in the same team as him and learn from him - just watching him and learning would be a great experience". Working with Dravid could mean seeing a systematic coaching structure he hasn't come across before, but Varun sounds ready. "It will be great because his (Dravid's) experiences can be passed on as information to others, it can help others as well. I can probably learn to be more disciplined from him, and structured in my game. All his experiences will really come in handy". While he dreams of playing for India and making his country proud, the immediate next step is the upcoming four-dayers. Carrying the tag of defending world champions, players like Varun and Rex Rajkumar Singh from the current batch, primed for success early, could be ones for the future.